Prime Minister Narendra Modi, along with the Prime Ministers of other countries participating in the Bay of Bengal Initiative for Multi-Sectoral Technical and Economic Cooperation (BIMSTEC) Summit, met Nepal President Bindhya Devi Bhandari on Thursday. Prime Minister Modi landed in Kathmandu on Thursday morning to attend the fourth BIMSTEC Summit. He will also hold bilateral talks with his counterparts of other countries on the sideline so the Summit. Indian Ambassador to Nepal Manjeev Singh Puri has said that the areas of trade, custom facilitation, grid connectivity, and counter-terrorism will be discussed during the Bay of Bengal Initiative for Multi-Sectoral Technical and Economic Cooperation (BIMSTEC) summit which is scheduled to start from Thursday. 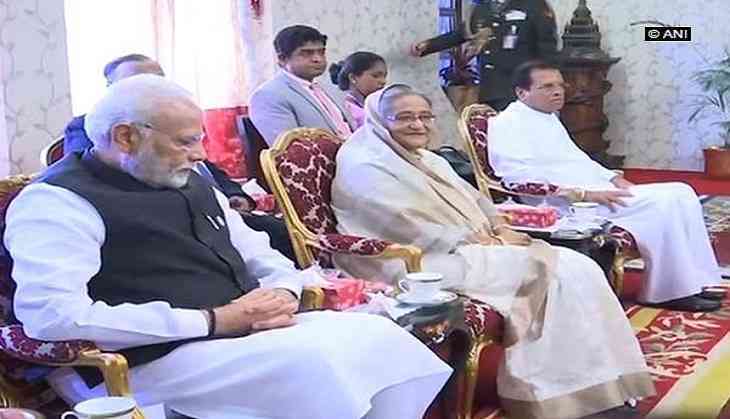 The envoy said that Prime Minister Modi would be meeting with foreign dignitaries at the sidelines of the summit, such as Sri Lankan President Maithripala Sirisena, Bangladesh Prime Minister Sheikh Hasina and Myanmar's head of state Win Myint, among others. On August 31, the Pashupatinath Dharamshala would be inaugurated which has been funded by India and would be handed over to Pashupati Area Development Trust, the envoy informed. "The Prime Minister will be meeting other counterparts from BIMSTEC countries. He is meeting the President of Sri Lanka, Prime Minister of Bangladesh, the Head of State of Myanmar and all the others who are coming here. As far as Nepal is concerned, he also has the bilateral meeting with Prime Minister KP Sharma Oli and we are inaugurating the Pashupatinath Dharamshala which India has funded and which we will be handing over to the Pashupati area development Trust on the 31st in the afternoon," he said. Commenting on the engagements during the two-day summit, Puri said, "The fourth BIMSTEC Summit starts in Kathmandu today. The first thing in the programme is the joint call and a lunch by the President of Nepal. After this, the inaugural ceremony will take place and in the evening there is a gala dinner host by the Prime Minister of Nepal. Next day, in the morning there is a retreat and then the closing ceremony. In that, they will adopt the Kathmandu declaration and chart the way forward for BIMSTEC." The BIMSTEC is an international organisation consisting of seven nations of South Asia and South East Asia, namely Bangladesh, India, Myanmar, Sri Lanka, Thailand, Bhutan, and Nepal. The main objective of the BIMSTEC is technical and economic cooperation among South Asian and Southeast Asian countries around the Bay of Bengal. India has been giving BIMSTEC more importance since the South Asian Association for Regional Cooperation (SAARC) has been affected by the non-cooperation of Pakistan on issues like connectivity and counter-terrorism.